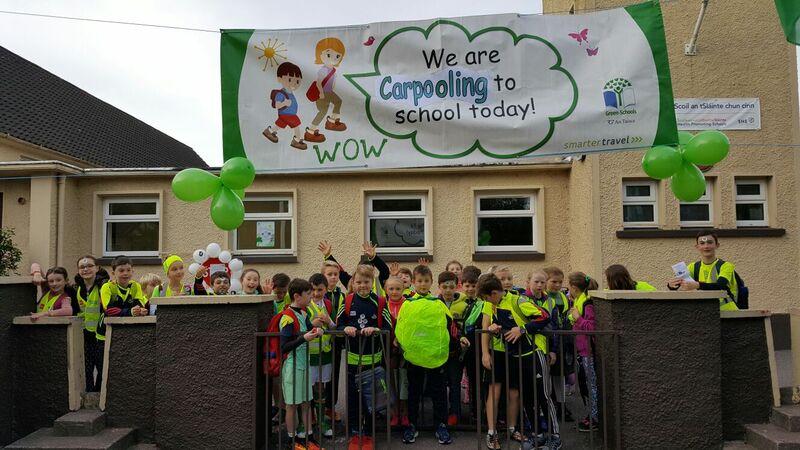 Coláiste Nano Nagle received their 4th Green Flag for Travel in 2017. 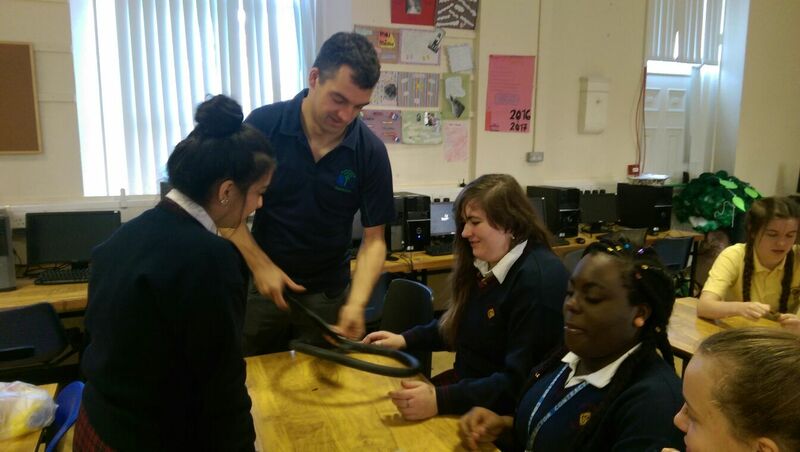 The school is an all girls secondary school located in the heart of Limerick City. In excess of 340 students and over 50 staff attend the school. The school is located on Sexton Street, which is a busy street with five schools in a cluster together. 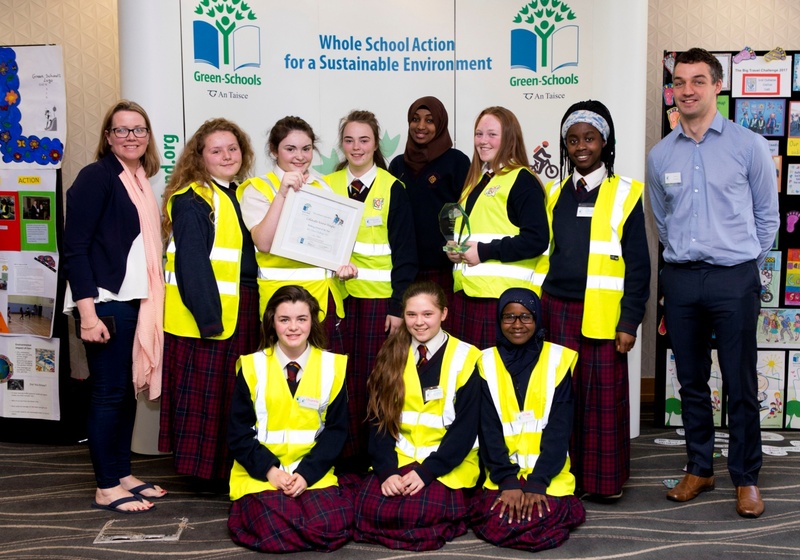 At the start of the year, all students are invited to join the Green Schools Committee. They are asked to write an essay about why they care about the environment and why they would like to join. Any students that do this are invited to join the committee. The Green-Schools notice board is in the canteen and important information is displayed on this. There are two school newsletters and Green-Schools is always featured in these. 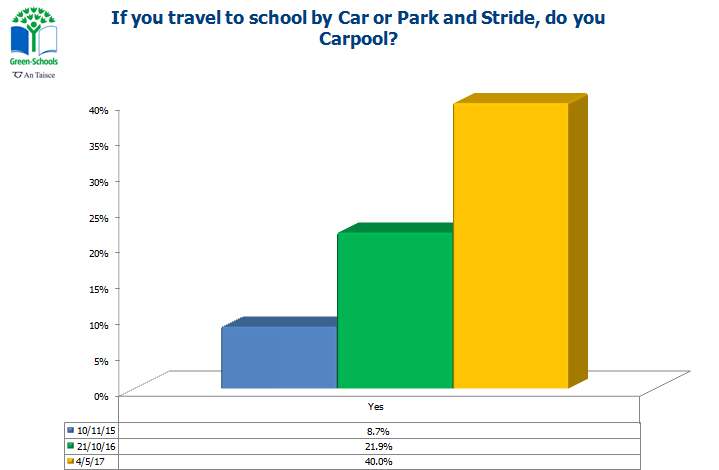 A baseline travel survey was carried out in the school by the Green-Schools Travel Education Officer to establish the current travel patterns to and from the school. 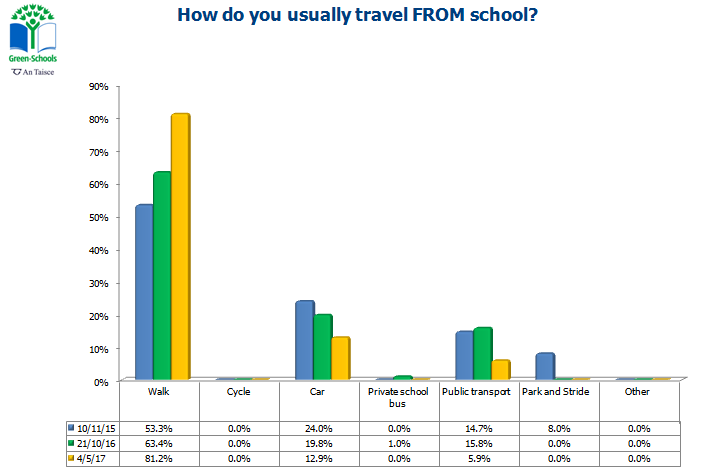 The results showed that the majority of the students travelled by walking to school at 56%. 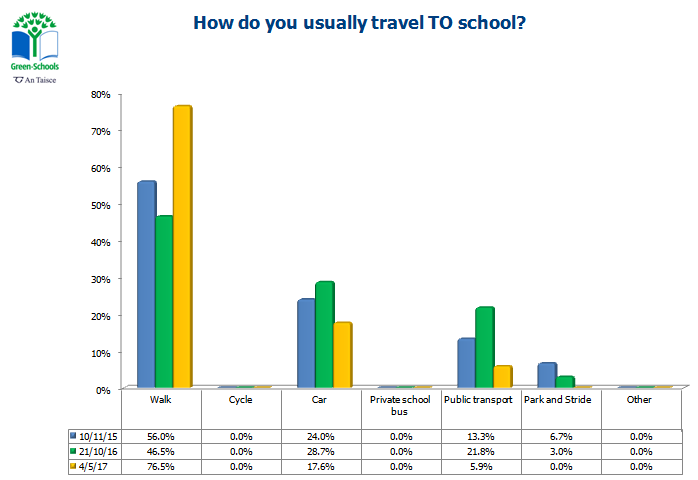 The second largest travel mode was car travel at 24% and 13% of students travelled by bus. Two walkability audits were carried out with the GS committee. These audits were to identify possible park and stride locations and any issues with the infrastructure around the school. 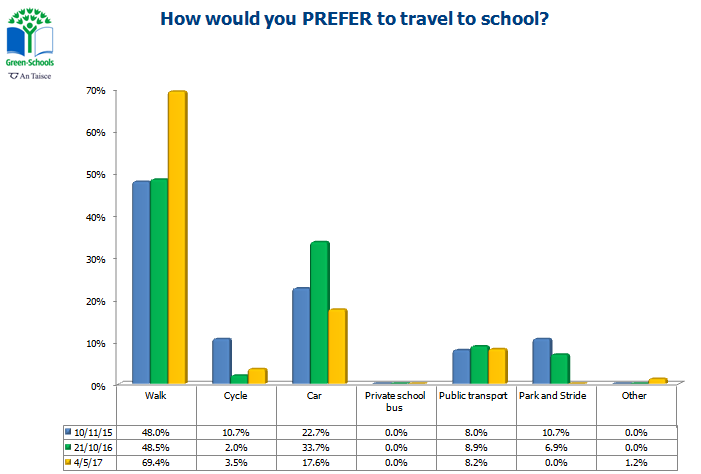 A walkability audit report was sent in to the council to request changes to make sustainable travel safer to the school. 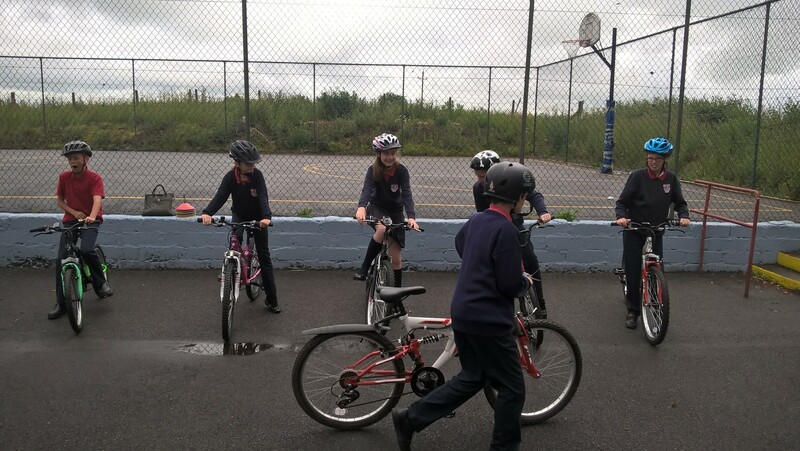 The Green-Schools committee prepared an action plan which included a number of ways to promote sustainable modes of transport which would suit their school. The school focused on a fun element was included to get more support from the students. 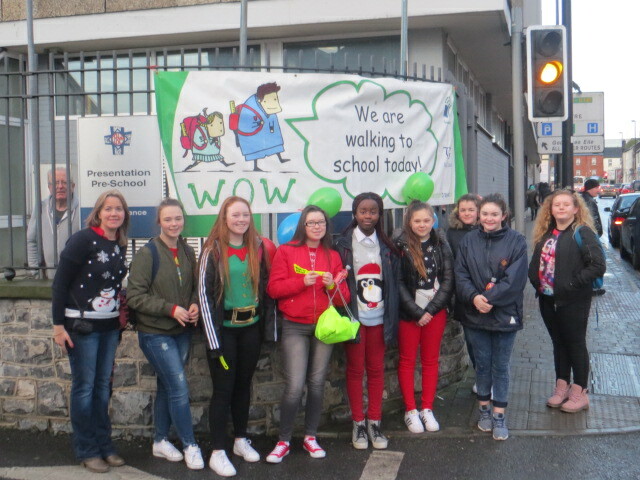 The school launched their walk to school events Christmas jumper themed Walk to School. This was a very popular event and similar events were organized throughout the school’s two years on the theme. Regular WOW days were a feature of the action plan. 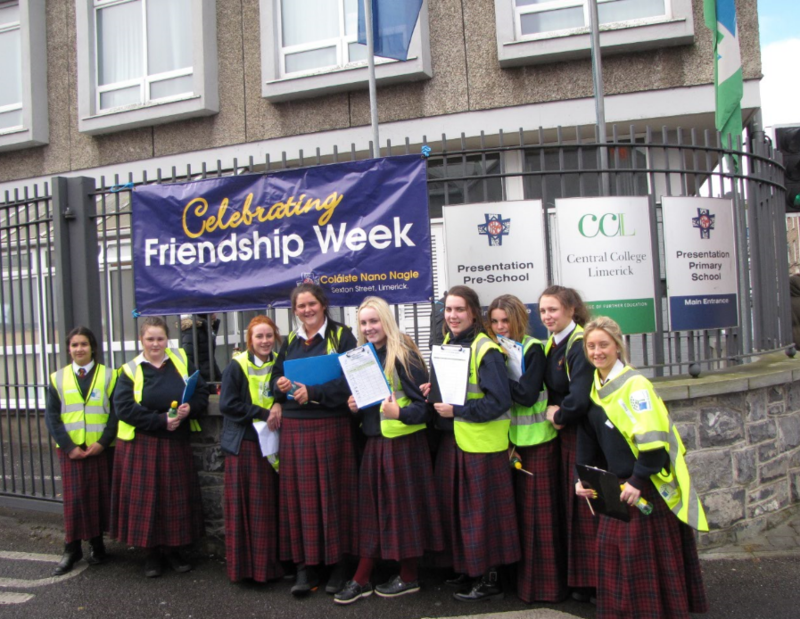 Other actions included: Dr. Bike workshops, awareness raising workshops, CSPE travel projects, participating in the Big Travel Challenge and National Walk to School Week promotion. The school focused on highlighting the number of steps taken by students on a daily basis. They raised awareness of the 10,000 steps requirement. They highlighted the benefits to the environment and to students’ health if you include a walk to and from school on a daily basis. A number of students and teachers monitored their steps and their results were shared on the schools newsletter and GS notice board. This highlighted that some students who traveled by car are below the recommended 10,000 steps. A poster of four teachers who were taking part in the 10,000 steps challenge was put on the Green Schools notice board. 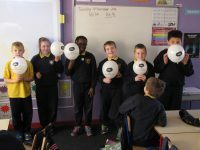 They recorded their steps on a pedometer for two weeks and this generated lots of interest in sustainable travel during this week of action. The Green-Schools work is incorporated as much as possible into the curriculum. A number of students incorporated the travel theme into some of their art projects. One student made the final of the Junk Kouture competition with their project which was made out of bike parts. 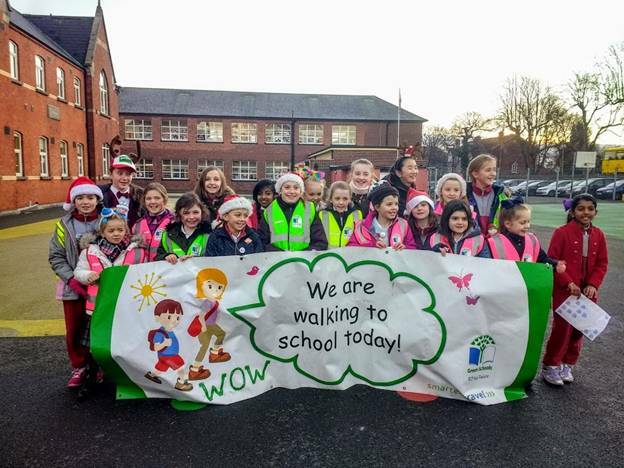 The schools Green Code is ‘Just Walk’. The English department worked with the students to help come up with an appropriate Green Code for the theme. 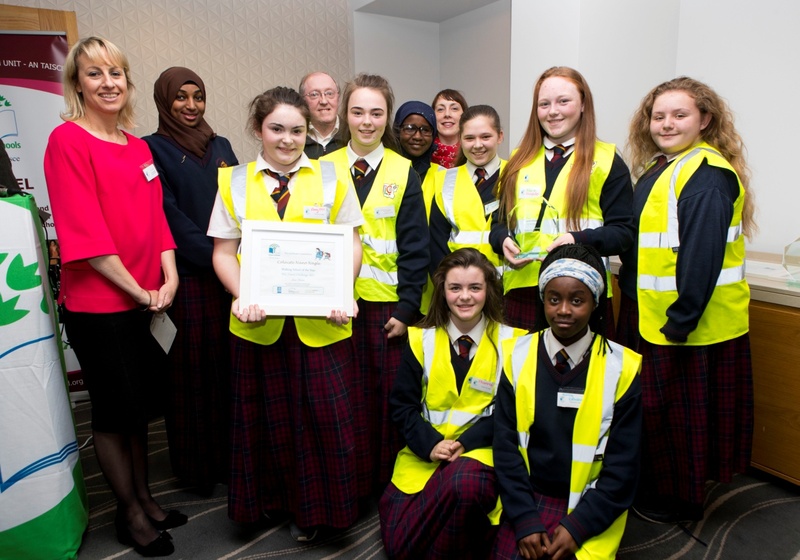 The school also used the work they carried out on the Travel theme to enter the young environmentalist competition. The Green-Schools committee informs the school community using various mediums. These include the Green-Schools notice board, class announcements and notices through the intercom when required. Various communication methods are very important in a secondary school setting. As part of the school’s day of action a morning assembly for all year groups was held. The Green-Schools coordinator spoke about pollution and the importance of not using the car. They also looked at the health benefits of walking. 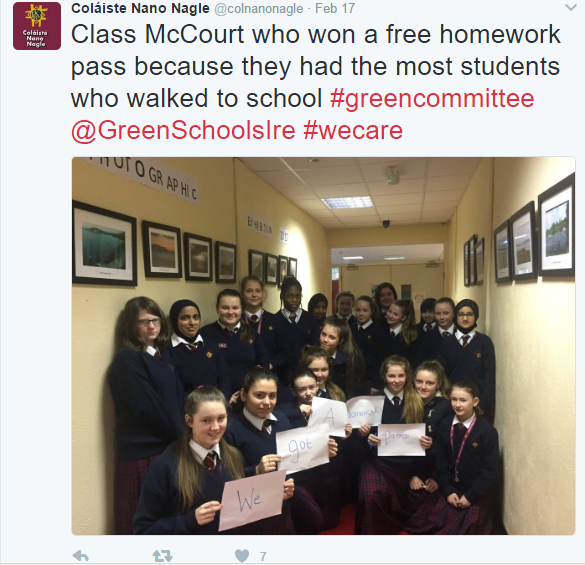 During this week Green-Schools Travel tips were sent out on Twitter. 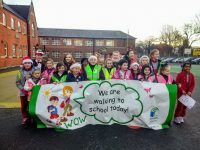 They held a WOW week, where students were encouraged to walk to school each day that week and were given Green-Schools prizes.